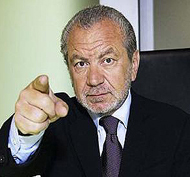 Due to our continued expansion and growth, we have exciting new vacancies to fill. We require both production staff and office staff. Do you have what it takes to become a GEM employee? For the 16th year in a row Gem are going through re-certification of ISO9001. ISO is awarded by NQA as a mark of commitment to improving performace through effective processes and working with best-practice principles. 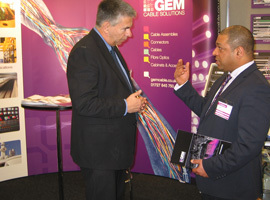 Delivering products which last long into the future across the major industry sectors that Gem Cable Solutions service like the Aerospace, Broadcast Satellite, Transport & Telecoms industries, can only be achieved with a total commitment to quality. Our Engineering Manager, Rob Harrington is delighted to announce the newest member of the Gem Cable Solutions team, his 1st born child Alice Izzy-Rose. Alice was a healthy birth weight of 9lb 1oz, although her father did note the poor calibration of the hospital equipment compared to that used by Gem Cable her mother however just felt sheer relief! We were delighted to be approached by leading US company Bullards – fire and safety specialists with a worldwide reputation for excellence – to create a solution designed specifically for thermal imaging equipment used in fire service training programmes. The brief was to create a new composite cable assembly capable of operating at temperatures in excess of 600 degrees C., supplying power to the cameras and linking up live video feed footage to the control room. The equipment means that instructors can see what’s happening in real time, and guide the Fire Fighters accordingly. GEM Cable designed and developed the assembly, and verification tests took place at the West Midlands Fire Service (click this link to see video of the testing – this replicates a ‘wind driven fire’ where windows blown out either side of a building dramatically increase the temperature). 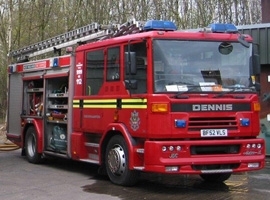 The West Midlands will be the first fire service to operate the solution, which is to be installed at their new purpose-built training facility later this year. While reliable, tracked delivery is an essential part of the GEM service, we recognise that keeping carriage costs down is equally important! We’re pleased to let you know that we’ve negotiated between 5-10% reduction with our suppliers on delivery costs across the board, and these new prices are valid from now until December 2013. You’ll see the maximum 10% discount on our most popular services – overnight ExpressPack1 (deliveries up to 1kg), ExpressPack5 (up to 5kg) and parcels (up to 15kg). All our delivery services are tracked – we’ll let you know when your order has been despatched and provide the tracking number. Please contact us if you need international delivery or pallet services – we’ll be happy to help. Click through to our delivery page for the UK tariff. In partnership with Oaklands College, we’re delighted to announce our Apprentice Programme offering young people aged 16-24 the opportunity to gain recognised qualifications in IT: Diploma in ICT Professional Competence, Certificate in ICT Systems and Principles, and the Microsoft Technical Associate (MTA). Our apprentices will also benefit from the programme’s broader focus on Key Skills and Business Skills including Professionalism and Customer Care in ICT, Employee Rights and Responsibilities, Developing Own Effectiveness and Health & Safety Awareness. 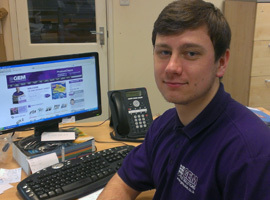 The first person on the Gem Cable IT Apprenticeship Scheme, pictured here, is Ricardas Brazauskas. GEM took a stand at Southern Manufacturing 2013, the UK’s largest and longest established manufacturing technology exhibition. 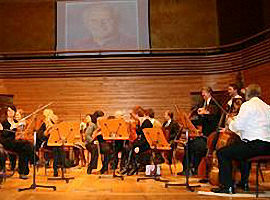 The event took place over two days at FIVE in Farnborough, Hampshire. The exhibition is always a great opportunity for us to meet our customers, and for suppliers and businesses to see the latest developments and solutions. Meteor Communications have commissioned Gem Cable Solutions to develop the wiring harness for their range of telemetry units which use GPRS and GSM technologies. These units are optimised for low power consumption whilst having a wide range of input and control options. This enables a huge variety of sensors to be used and also interface to control equipment such as pumps, autosamplers, weir gates and dosing equipment. The engineering teams at both Gem Cable and Meteor worked very closely together to evolve the wiring harness into its current format, making sure it meet all of the customer’s stringent requirements for life in the field. With internal power systems the units can power sensors and control remote equipment, whilst inbuilt regulators allow for direct connection of solar panels to supplement the internal power packs. 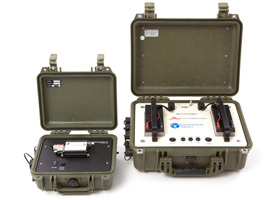 Units can operate autonomously for months using their own internal batteries, or indefinitely with a small solar panel. MD Steve Jack handed over a total of 40 family football match tickets to local schools after GEM Cable teamed up with St Albans City FC. The two schools also enjoyed a visit from the team’s players, with goalkeeper Nick Jupp being closely questioned at St Alban and St Stephen Infant School! 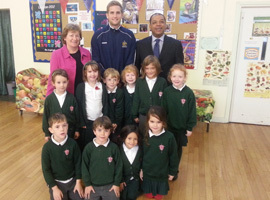 Head Teacher Paula Holden said: ‘It was wonderful for our children to meet Nick Jupp. He answered their questions about keeping fit and eating healthily in order to play well. Many children were not aware that we have a local football club right on our doorstep and they are keen to support our local community team.’ Tickets were also donated to St Alban and St Stephen Junior School, with City’s Defender Chris Seeby coming along to the assembly presentation. 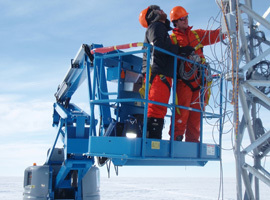 Based in Cambridge, the British Antarctic Survey has undertaken the majority of Britain’s scientific research on and around the Antarctic continent for more than 60 years. With a keen eye on continuous improvement and added service value, Gem Cable Solutions has made a major investment in Cable Assembly test equipment, by upgrading to the Banair BA765 which we selected after extensive research and evaluation. This high specification tester will measure many cable parameters. As well as measuring cable resistance very accurately using the Kelvin 4-wire method, the Banair BA765 tests for shorts between pins at a low voltage. 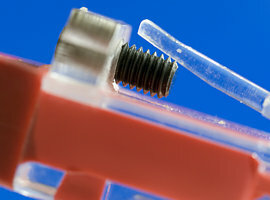 It will then perform a test to measure insulation between connections at a higher voltage – up to 1500 Volts DC with resistances of 1 to 100 Meg ohms. There are many optional tests that can be carried out including HiPot tests and AC tests at up to 2000V. It is also possible to add and LCR tester and check that capacitors and resistors have been correctly fitted. The modular design of this cable harness connection test system provides flexibility so that it will meet both our present requirements and it can expand for our future needs. The cable harnesses and connection test results are displayed clearly on the screen; the table shows resistance values Inductance and Capacitance value, as well as Pass or Fail results for shorts and continuity Hipot DC / AC. This allows quick rework and feedback to production of the nature and position of the faults. All the results are stored in a standard Access database format allowing production and quality control to record test results and to analyse them for AQL. 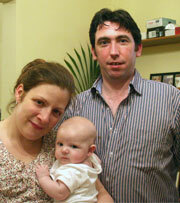 We can also supply you with an electronic copy of your results for future reference. 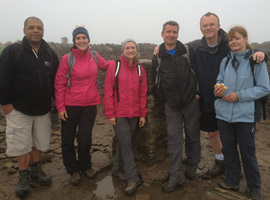 Gem Cable Solutions MD Steve Jack completed the Yorkshire Three Peaks Challenge in June as part of a team which raised nearly £600 for the Children’s Society. The Three Peaks route takes in Pen-y-Ghent, Whernside and Ingleborough and must be completed in less than 12 hours. The team of six from Gem and PH Energy Services walked the 25 miles in 10 hours and 30 minutes – and as none of them had tackled this type of challenge before, their months of intensive training had clearly paid off! The Children’s Society works with more than 44,000 children and families each year through its Children’s Centres and by lobbying for child protection policies. ‘Music to our ears’ was GEM Cable’s response when asked to design a complete network infrastructure for this highly respected school for the musically gifted. 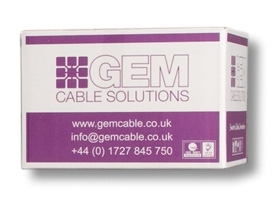 Another exclusive from GEM Cable Solutions, the lockable RJ45 connectors are proving an effective way of increasing network security and safety.